Although hard to believe, you can enter a hospital in need of treatment for one condition and end up dealing with a serious infection. In certain cases, these infections cannot be effectively treated with today’s antibiotics. An infection is always a problem, but when the only treatment available cannot eradicate it, the situation can quickly become life-threatening. Antibiotic-resistant bacteria has earned its place among the most severe health threats facing the American public today. As a result, it is vital for hospitals to take aggressive preventative action as it relates to drug-resistant germs. Failure to do so is beyond irresponsible – it is justification for legal action. Germs resistant to antibiotics, also known as drug-resistant bacteria or superbugs, are a type of bacteria with unusual immunity to antibiotic medications. These germs can cause difficult-to-treat or untreatable infections, as they cannot be successfully curtailed with the drugs typically used to cure infection. The dangers of drug-resistant bacteria are manifold. First, they tend to spread rapidly. This becomes particularly problematic in a hospital environment where there is a high concentration of people in a relatively small space. Moreover, many patients in the hospital are more vulnerable than the public at large. Special populations like children, the elderly, and those who already suffer from a medical condition, are particularly prone to contracting infections while receiving acute care. Also, certain people carry a small amount of hard-to-treat bacteria in their bodies at all times. Tests revealed that 1 in 10 people – with no symptoms – had an easily spread, drug-resistant bacteria in their bodies. These germs do not cause illness in some because of the minimal quantity, which is usually balanced out by other cells present. The problem arises when a person’s immunity is compromised or they are given medication for another condition that reduces the amount of good bacteria in their system. When one person develops an infection caused by a drug-resistant bug, it immediately imperils those around them. How Common are Drug-Resistant Germs? Superbugs have been identified in every single state in America. While the number and type of antibiotic-resistant bacteria vary from state to state, the Centers for Disease Control and Prevention (CDC) recently announced that this category of “nightmare bacteria” are spreading rapidly throughout our nation’s hospitals. According to the CDC, over 23,000 people in the U.S. die as a result infections involving antibiotic-resistant bacteria every year. In fact, half of all cases involving drug-resistant infections will result in death. To combat this pervasive problem, the CDC has implemented numerous strategies to track, identify, and assist hospitals in preventing and immediately responding to infections involving drug-resistant germs. The CDC estimates that zealous preventative action could reduce the number of one specific type of antibiotic-resistant infection by 1,600 in a single state over the course of three years. Unfortunately, many hospitals fail to follow protocols for infection-prevention and pure negligence leads to deadly illnesses for their patients. 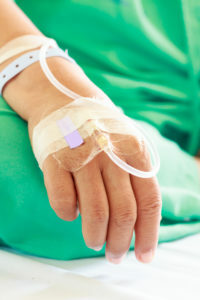 If you or a loved one contracted a serious infection while in the hospital and suffered complications as a result, it is highly advisable to seek guidance from an experienced New Jersey medical malpractice lawyer. At Fronzuto Law Group, our dedicated team of attorneys works to obtain maximum compensation for victims who suffer harm resulting from medical negligence. If a hospital may have prevented your infection through proper sterilization or drug-resistant bacteria procedures, we can help. Call us now at 973-435-4551 or arrange a free case evaluation and find out if you may have a hospital infection malpractice claim.